This is a dia 25 cradle bolster; a type of vehicle that I have not seen on another railway. It has a square cradle that sits on the top of this, with four bolsters protruding from the corners of the cradle. They were used on pairs and the whole cradle rotated when the pair of vehicle went around curves. The intention, I presume, was to offer the load more support by offering more points of contact. Anyway, as no one else had tackled this vehicle before, I thought I would have a go! As this is my first etched design for a vehicle, I have certainly encountered a number of problems. As the top photograph shows I produced this in both 4mm and 7mm; the latter has proved more successful due to the thickness of metal being greater. The main issue that I created for myself was to half etch the solebar overlays so that the rivets and the ironwork could be portrayed. However, rather than backing them on a further layer of etch (like the etched kits I have built – they evidently knew something……), I spanned it between supports. 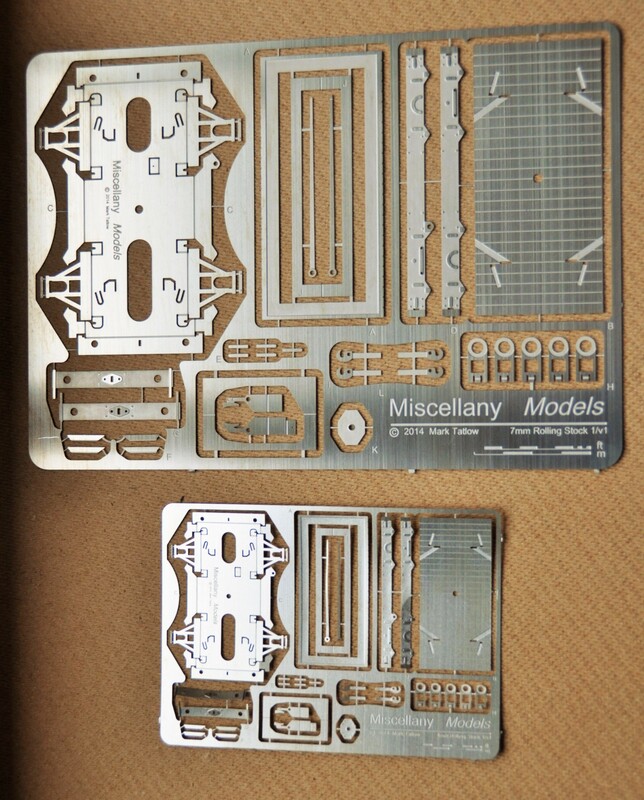 The intention had been to make the kit fold up more readily but in practise what has happened is that the half etched solebars have distorted (badly in the case of the 4mm one) due to the stresses introduced in the heat from soldering. Thus, whilst I have a working model (at least in 7mm), a rework is going to be required. 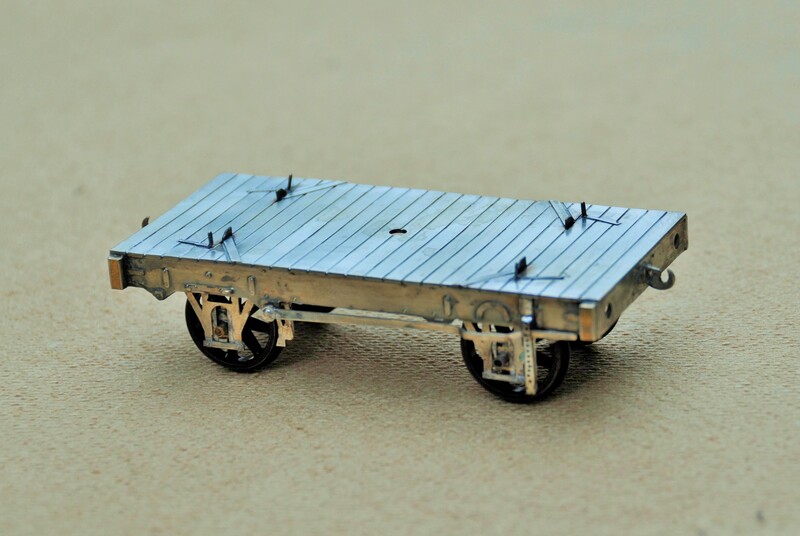 Both the 4mm and 7mm versions will have sprung axleboxes, using a varient of the guitar wire sprung version used by Bill Bedford and others. The 7mm chaps don’t seem to use it much and I guess the mass of their models helps. However, it does glide with the springing and is better as a result I reckon. I have also done a 3-D design for the cradle, which I am proposing to use as a master for some resin castings (certainly in 7mm, I might go down the lost wax brass route in 4mm). A new process that I have not previously attempted. I need to find out where to get axleboxes and buffers from – Larrie Griffin I presume. Also back from PPD, were some etches for something altogether more bold (which is a worry in the light of the problems I have encountered on a relatively simple wagon!). 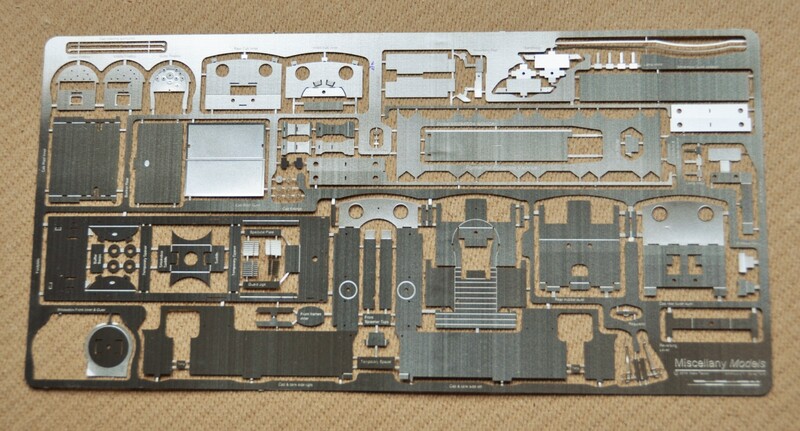 This is the chassis and body etch for a Drummond Scrap Tank. I have made a start on this and again, some reworking will be required but again there is a viable model in an amongst these parts; it just needs tweeking. More to follow once I have got further with it. 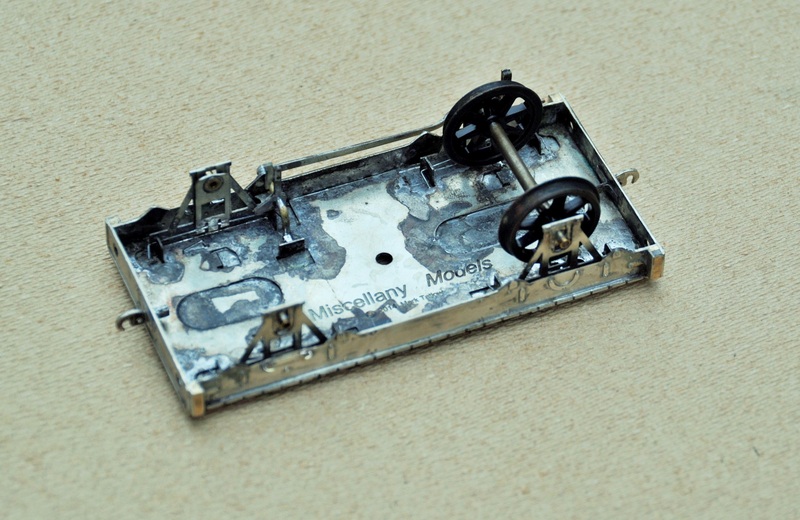 Posted on November 16, 2014, in Miscellany Models, Workbench (stock) and tagged etching, Highland Railway, Miscellany Models, Model Railway. Bookmark the permalink. 2 Comments.